A century ago, Michigan Avenue and nearby Streeterville were rather sleepy places. With the completion of the Michigan Avenue (now DuSable Bridge), elaborate plans for the future emerged. 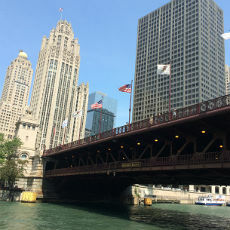 Some plans were realized, including a number of marquee skyscrapers such as the Wrigley Building and the Tribune Tower. Others took longer to come to fruition, and some were abandoned after economic slumps or a lack of political will. This tour will take visitors around this stretch of the Magnificent Mile and beyond to talk about a few of those plans.